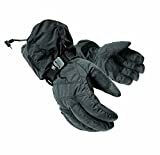 Ansai heated gloves have actually been around for a while but they’ve only been selling on Amazon for a short time so people are just now starting to notice them. The first thing I noticed about these gloves is that they look better in real life than they do in the picture. Maybe it’s just me but I thought the photo of them on Amazon made them look bulky, ugly and cheap. Fortunately in real life they look pretty sharp. They aren’t bulky at all and they’re a clean, bright looking black that stands out nicely. I guess they need to work on their photography. The interior of them is made of a fleece like material which makes them nice and soft on the skin for a comfortable feel. They have a cinch strap located on the lower wrist which is great because you can tighten them up to your liking. The gloves I ordered fit me properly but I did notice that there was quite a bit of movement on my hand because the interior lining of the gloves and the shell are quite loose. Basically this just made for less dexterity and mobility. The best way to describe it would be to say that they aren’t very form fitting especially when compared to other gloves. I’m not sure if this was done on purpose to make them hold the heat better but if that’s the case, it worked. The heat retention was really good thanks to the Thinsulate insulation. The heating elements run along the back of the hand and the back of the fingers and thumb. There are 4 settings of heat and the hottest setting gets really quite warm. I found that the two middle settings were perfectly adequate and I wore them in 34°F for a whole day. With the heat on high they got very hot. For comfort I’m giving them a 15/20 and for warmth I’m giving them a 19/20. Nowhere on the Amazon sales page did it say anything about water resistance so I wasn’t sure what to expect. Usually when it doesn’t say anything that means that they aren’t waterproof. Upon receiving them I inspected them to see if there was any sort of liner inside them that would prevent water from getting in but I couldn’t see any sign of it. The exterior is what they call a Carbolex shell and it’s pretty much just a nylon material. It does pretty well at keeping the water out but in heavy rain or really wet snow your hand will eventually get wet. I’m giving them a 15/20 in this category. Quality is always a big question mark when you buy a relatively unknown brand like Ansai especially when it’s made in China. When I received my gloves in the mail I did a thorough inspection of them. I tested the zipper, the electrical components, the strap and I pulled them on and off a whole bunch to get a feel for them. I couldn’t see any signs of them being poorly made or made with cheap materials. The stitching looked good and tight and the fabric all seemed sturdy. I guess only time will truly tell. For this category I’m giving them a 18/20. These gloves come with two 7.42V lithium-ion batteries and a charger that can charge them both at the same time. The fact that these batteries are 7.42V made me excited because most other battery heated gloves only come with a 7V battery. They’re advertised to get up to 10 hours. Actually on Amazon it contradicts itself because in one place it says they can get up 10 hours and in another place it says they can get up to 9 hours. I put them to the test. When heated gloves say they can get a specific amount of time that usually means that if you start them on a full charge and then run them on the lowest setting, that’s what you’ll get. So that’s what I did. I wasn’t disappointed but I didn’t get the same results they got. For me the battery lasted 8.5 hours on the lowest setting which is still very good. In fact that’s even more time than you’ll get with some of the highest end brands. Then I tested them at full heat and I was able to get 5.5 hours which is still very good. On a regular day you will normally switch between low, high, medium and off. My guess is that you would get anywhere between 5.5 – 9 hours which is awesome. For this category I’m giving them a 19/20. They fit very true to size but like I said before they might feel a bit loose but that’s just the design. If you aren’t sure about what size to order you should have a look at my sizing guide and that should clear it up for you. So as you can see these gloves scored really well in battery, quality and warmth but not so good in comfort and water resistance. So whether they’re right for you or not totally depends on what you intend to use them for. Or more accurately, what climate and conditions you need them for. I think that for the price these Ansai heated gloves are pretty good value. They aren’t the cheapest gloves around but they fit in right around the middle of the pack. Considering it’s a relatively unknown brand I was very impressed with these gloves and I would recommend them. If you have any questions or comments please use the field below and I’ll be sure to get back to you ASAP.